It's a basic law of cooking: whenever you're really craving something, you don't have it. All you want is a glass of wine? Chances are you finished the bottle while braising meat last night. Want nothing more than a sandwich right now? Yep, you finished the bread with breakfast. You'd kill for a steak? They're all in the freezer, and you don't want to wait while they thaw; you want your steak now. 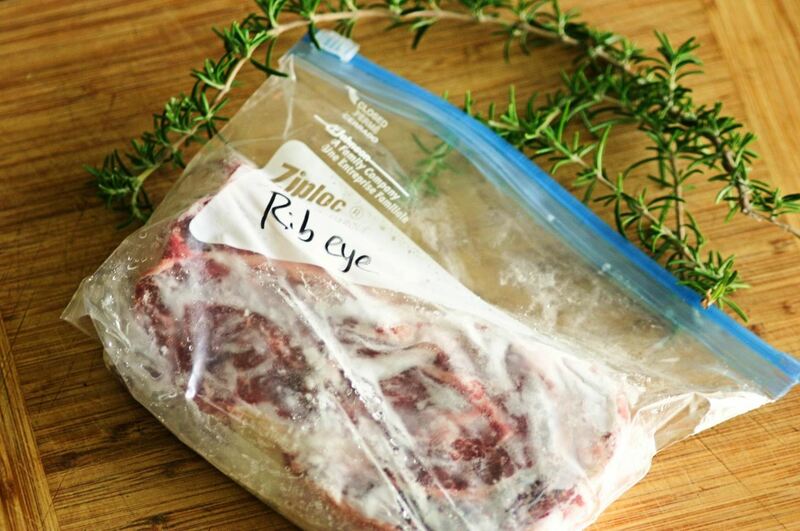 I can't help you with the non-existent wine or bread, but I can help you with the frozen steak, thanks to one of my all-time favorite food hacks: thawing a steak in minutes, without hurting it at all. I probably didn't need to tell you to remove the steak from the freezer in order to thaw it. However, make sure that your frozen steak isn't wrapped in a million layers of plastic and paper. Conversely, make sure it is wrapped in something, so that you don't lose all of the juice as it thaws. Your best option is a ziplock bag (preferably one that's already vacuum-sealed). You don't need to add a ton of water to the pot, just enough to make it heavy. If you fill it too full, it can be hard to get it to balance, as the pot will soon be perched atop your steak. 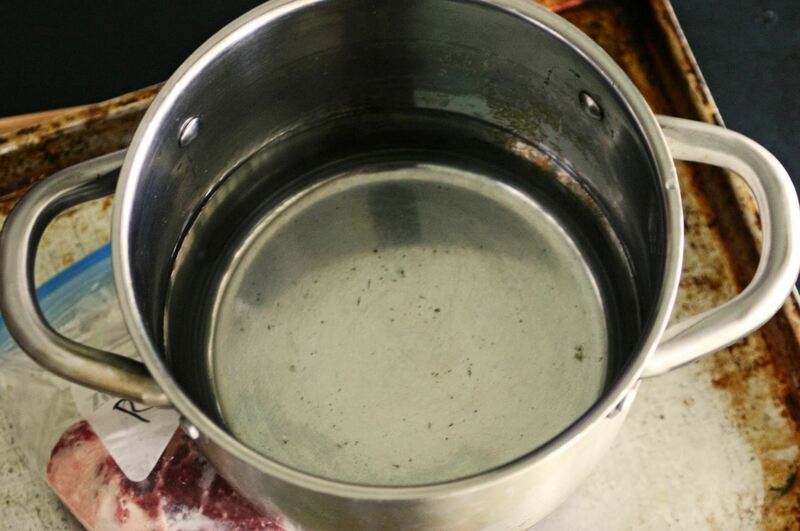 Make sure to use room-temperature water, as cold water will slow the process, and hot water will cook the meat. Before you put your pot of water on the steak, place your steak on a baking sheet, or an upside-down pot. Then place the pot with the water on top of the steak so that the meat is sandwiched between the two items. 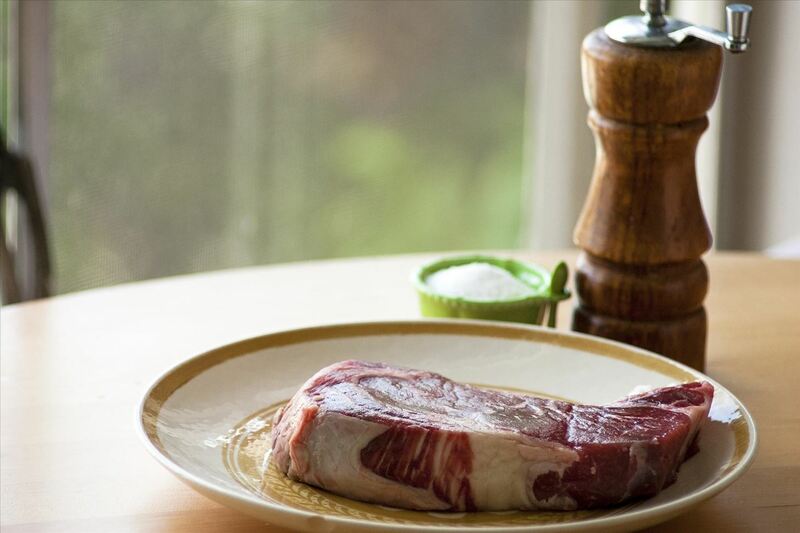 In a mere matter of minutes, your steak will be perfectly thawed. If you're using a thin cut of beef (such as a flank steak), it will only take five minutes. A thicker cut (such as the rib eye shown here) will take 15–20 minutes. There are two things at play that make this thawing method work. 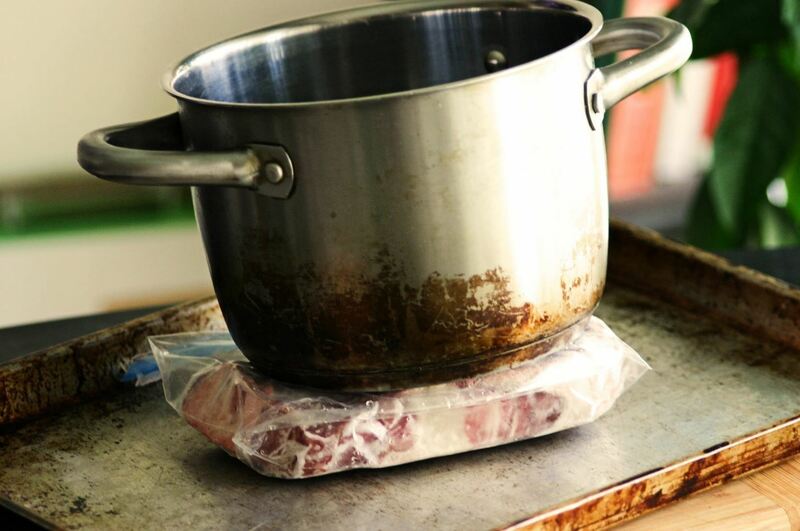 First, the weight of the water-filled pot applies just enough pressure to the steak to increase its surface area, and thus makes it easier to thaw. Second, metal conducts ambient heat, which, as it turns out, can defrost a steak quite quickly. Two pieces of metal conduct the perfect amount of heat to rapidly thaw a steak that is sandwiched between them. Why Is This Method Ideal? To my knowledge, this is the only way to quickly thaw a steak without any negative side effects. Some people advocate putting the steak in hot water or the microwave, but both those methods will begin to cook the outside of the meat while leaving the inside raw. Others suggest running cold tap water over the frozen steak until it's thawed, but this method is incredibly wasteful, and not very quick. Of course, you can always try cooking the frozen steak, but if you want it thawed, and quickly, this method is the way to go. There's nothing like a great steak, which is why you should always let it rest before carving. And if you want a foolproof method for making a great pan-fried steak, be sure to salt the skillet, not the steak. would this same trick work with frozen chicken fillets? Thanks man. If it works, i wont be back. If it doesn't, then ill be back and complain a little. long story short- if it works, thanks a ton and you'll never hear from me again--which should make you a little sad, cause I'm a helluva guy. I also like the salted skillet idea. will give it a try. Works! had a frozen solid ribeye that was two inches thick (like they sell at Costco) and defrosted in 30 minutes! Instead of using a metal baking sheet, I just laid the bag with the steak in my kitchen sink ( it's stainless steel) and put the pot of water on top. Defrosted in less than 1/2 hour! Great hack. This is amazing! Had a 3/4" thick frozen steak in its original shrinkwrap (never mind...). Perfectly thawed in less than half an hour. Best method ever. Thanks! Yeah, so far 45 min. This is horseshit. I get the physics, but say it takes an hour, when it takes at least an hour. I had 6 thin cut boneless steaks frozen solid. Followed the directions given here, and they were completely thawed in 36 minutes. When that worked, I figured I'd salt the pan too. It came out excellent. Thanks!